Aster lanceolatus of Michigan Flora. 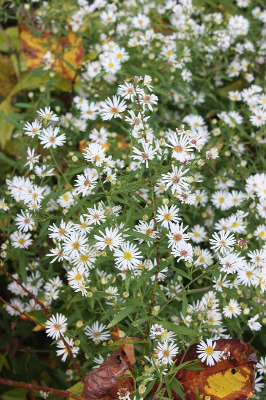 One of our commonest asters, especially in moist open ground including shores, river banks, edges of forests and swamps, meadows, ditches and swales, interdunal flats; wet prairies, marshes, fens; fields, along old railroads, roadsides. Often forming large colonies from long-creeping rhizomes, but highly variable. Plants with large blue-rayed heads superficially resemble S. robynsianum, but differ in less clasping leaf bases, more imbricate phyllaries, and tendency to shorter leaves and more heads. Such plants represent S. lanceolatum var. hesperium (A. Gray) G. L. Nesom and are known from Benzie, Delta, Manistee, Osceola, and Schoolcraft Cos. Plants with pubescence uniform (rather than in lines, or absent) on the middle and lower internodes have been named var. hirsuticaule Semple & Chmiel. Plants with quite small heads (involucre under 5 mm long), very numerous and crowded on branches of the inflorescence, have been called var. interior (Wiegand) Semple & Chmiel. Plants with stems glabrous or pubescent only in lines and with heads not crowded include plants with broadly oblanceolate leaves (var. latifolium (Semple & Chmiel.) G. L. Nesom) and plants with narrow, linear to oblanceolate leaves (var. lanceolatum). These last four varieties appear to be widespread, but we have no abundance data. Sometimes this species is confused with S. pilosum, and indeed these two species appear to hybridize, but besides its unique phyllaries, involucre shape, and cespitose habit, Symphyotrichum pilosum tends to have the pappus of the disk florets shorter than the corollas, while in S. lanceolatum and its allies, the pappus equals or exceeds the disk corollas. Plants intermediate with S. puniceum and especially S. firmum seem to be more frequent than some supposed hybrids. And a number of plants resembling S. lanceolatum but with deeply lobed disk corollas presumably have resulted from hybridization with S. lateriflorum. MICHIGAN FLORA ONLINE. A. A. Reznicek, E. G. Voss, & B. S. Walters. February 2011. University of Michigan. Web. 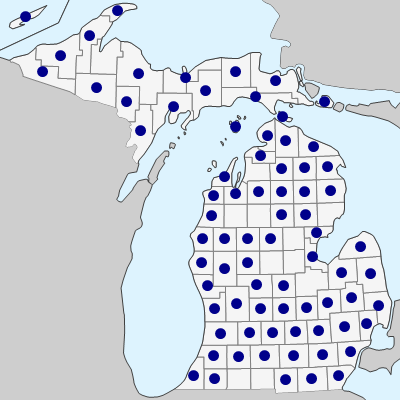 April 21, 2019. https://michiganflora.net/species.aspx?id=485.